A lot of times, money can be a big issue for people wanting to switch to a healthier diet of organic, traditional, real food. Many people want to eat better quality food, but they don’t know if they can afford the extra cost. 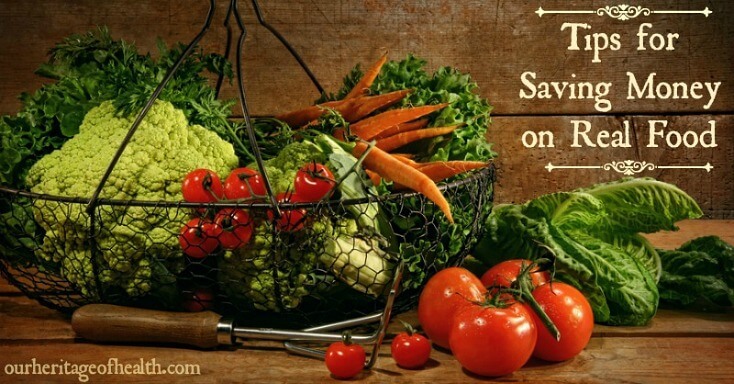 There’s no doubt about it that organic food usually is more expensive than conventional food, sometimes a lot more expensive depending on where you live and where you shop. With a little bit of planing, though, there are ways to work around the extra cost and still be able to get good-quality real food while staying within your budget. Sometimes a lot depends on your priorities, too. There have been times when I’ve had to decide whether I’d rather buy a new pair of shoes or buy organic, real food. More often than not, I choose the food because the quality of the food I eat is important to me. In my quest to eat a healthy real foods diet without going over my budget, I’ve found several ideas for saving money on real food that have been really helpful to me. 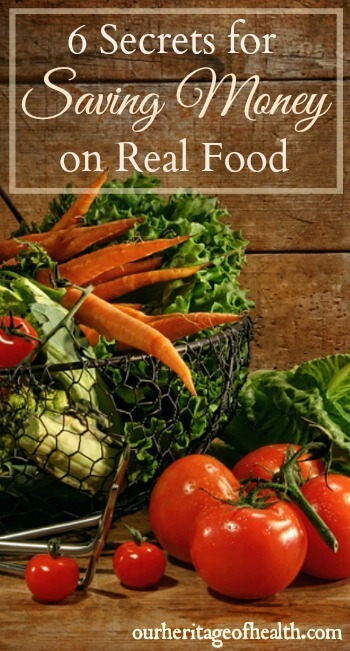 Some of these ideas take a little more time than just buying convenience foods at the store, but as this Real Food Economics series by Granny’s Vital Vittles explains, you can’t have time, money, and quality all at the same time. Assuming that the quality is important since this is a post about real food, and assuming that saving money is important, that means we have to be willing to spend a little bit more time in order to have the quality food we want and save money at the same time. This is one that it took me a while to start doing. I would always see the initial cost of buying in bulk, and I would end up just buying one box or bottle of whatever it was I needed because I didn’t want to spend so much money all at once. As I started buying more things online, though, I realized that buying in bulk is often a way to get reduced or even free shipping. When I buy my grass-fed gelatin from Amazon, I get 2 cans instead of one because I’m able to get free shipping when I do that. And when I buy einkorn flour, I get the big 10 lb. bag so that I can get free shipping and so I don’t have to order as often. I haven’t tried it myself, but I’ve also heard of people saving money by buying meat in bulk, like getting a quarter or half of a grass-fed cow for a cheaper price than buying individual cuts. Many smaller farms offer discounts like this when you buy meat from them in bulk, so check around and if you have a large family, or if you have friends who might want to split an order with you, buying meat in bulk might be a good way to save some money. It might take a little bit more time than buying convenience food, but cooking from scratch is definitely a way to save some money on real food. Even though organic, real food ingredients often cost more, it’s possible to save quite a bit of money by making things yourself from scratch rather than buying pre-prepared organic food or eating meals out at a restaurant. One of the things I always make from scratch is soup, like my chicken and swiss chard soup. I’ll make a big batch of this and save the extra in single-serving mason jars in the freezer. Then, any time I want a quick meal, I can pull out of the jars out to defrost and heat it up on the stove. It’s basically the same as buying cans of organic soup, only it costs much less. One of these days, I’ll have to do the math and figure out exactly how much making my own soup saves, but if you figure that each can of store bought organic soup is probably around $3.00 or so, and each batch of soup usually gives me enough for about 16-18 servings, I’m probably saving quite a bit. I also make my own sourdough bread using homemade yeast every week. Finding real, good-quality sourdough bread isn’t always easy, and chances are it probably won’t be cheap either, but making your own is a great way to save some money. Again, I haven’t done out the math (since I’ve always hated math), but I’m sure the cost of a few cups of flour, some salt, and a little sweetener is nothing compared to the cost of buying a loaf from the health food store. There are times when you can find food that is just as good quality as organic food but without the official organic label. Many small farms can’t afford the cost of organic certification even though they may be growing their produce or raising their animals in a way that would still meet organic standards. For example, I get my eggs from a very small local farm, and they aren’t certified organic, but the farmers use organic feed for their chickens, and the chickens are completely free-range and pasture-raised. I’ve seen them happily roaming around in the sunshine pecking in the grass. So, even though they don’t have the official label, these eggs are just as good quality or maybe even better than eggs in the grocery store that are labeled organic. If you do a little bit of searching around, you may be able to find good-quality “organic” food that costs less than food with the official organic label. Talk to the farmers or check out their website or facebook page if they have one to find out more about how they grow their produce and raise their animals, what types of fertilizer they use, how they manage pest control, etc. If you have the space and the time, growing your own food is a great way to get organic produce for much less than you would spend at a health food store. The first year you plant a garden, there’s the initial cost of buying gardening tools, putting up fencing or building raised beds, etc. but once you have all of that in place, the following years you can save quite a bit of money by growing your own. A packet of organic seeds is usually somewhere around $2.00-$3.00, and each packet contains several dozen seeds usually, so if you have the room, you could get a lot of seedlings out of one packet of seeds. And if you use heirloom seeds, you can even save some of the seeds from your plants to use for the next year’s garden. Another way to save money is by buying items that can serve multiple purposes. One of my favorite multi-use items is coconut oil. You can use it for just about anything, including cooking, baking, DIY beauty recipes, etc. My favorite coconut oil is an expeller pressed, refined coconut oil because it has a very mild, neutral taste and smell, so it’s great if you want to use coconut oil for a lot of things but you don’t want everything to taste and smell like coconut. This is another money-saving method that I’m trying to do better with. It’s so easy to forget about food that’s hidden way in the back of the fridge or tucked away in the corner of the pantry and to let that food go to waste simply because I had forgotten about it. One way I’m trying to avoid wasting food is to do a quick once-over of the fridge once a week and of the pantry every month or two just to check to see what foods might be getting close to spoiling or close to going out of date. That way I can make sure I use those foods up in time and plan my meal schedule around what foods I need to use. I’m also trying to get better at remembering to write a date on boxes or bags when I open them so later on I can remember how long they’ve been open for. And the same for storing leftovers in the fridge, too. That way I don’t run into the problem of having two containers of leftovers in the fridge that look similar but not being able to remember which one was from which week. It only takes a second to write the date down, but it’s saved me the time of trying to figure out how old something is, and it’s kept me from wasting quite a lot of food.